There is a natural tendency in pop music to go for bigger arrangements, with more instrumentation for a larger, presumably more commercial sound. But sometimes it’s interesting, and it can be a challenge to musicians to come up with engaging music with limited instrumentation, in some cases instruments not normally in the spotlight. In early 2016, we reviewed the album Weighted Mind by singer-songwriter Sierra Hull, whose instrumentation was almost exclusively mandolin and acoustic bass. This week, we have another example of a pair of musicians making surprisingly rich and multifaceted music with just a violin and a cello, and vocals, of course. The duo calls themselves Oliver the Crow, and that is also the name of their debut album together. Ben Plotnick is the fiddler or violinist and Kaitlyn Raitz is the cellist. Both sing, and they are not afraid to use overdubbing on their album, but it’s still an impressive and musically intriguing project. While the duo is currently based in Nashville, both Ben Plotnick and Kaitlyn Raitz are Canadian, with Ms. Raitz having a masters in cello from McGill Unviersity. She was a founding member of the folk duo Bride and Groom. Plotnick is from Calgary, Alberta, and while growing up, played with the Calgary Youth Orchestra, then studied jazz at Humber College in Toronto. We featured Plotnick’s own album Greenland on this series in early 2017. He also performs with a folk string quartet called The Fretless, and in recent years has done a lot of studio work with his fiddle. On a chance meeting, when they lived in different cities, Raitz and Plotnick quickly decided to work together an an EP, which they released last year. Now they are out with a full length recording, made incidentally at a totally solar-powered recording studio in a remote location in Vermont. Their routine included recording and then monitoring the power they had left at the end of the day. The material consists of mostly original music with songs by each of the duo, plus a traditional piece and a cover song by Regina Spektor. While Ms. Raitz’ cello often sounds classical – one almost can’t help that – Plotnick usually compensates for that and often plays in an old-timey fiddle style. They can also get somewhat atmospheric when they want to. While some of the music is played fairly straight with just the two instruments more or less in real time, as mentioned, they are not afraid of overdubbing and adding a few studio effects, to create layers of sound. All the percussion sounds are done with the playing technique they use on their instruments. 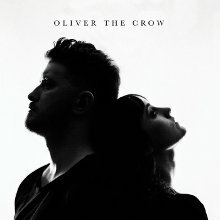 Oliver the Crow, the debut full-length album by the duo of same name, with fiddler Ben Plotnick and cellist Kaitlyn Raitz, is a creative, sonically appealing recording by a duo taking two instruments which are rarely in the spotlight in contemporary pop and making a whole fascinating record with them. The original material is first-rate and the group’s arrangements of the traditional song and the cover tune are equally imaginative. It’s both an intimate sounding project and one that can be sonically expansive with the tasteful overdubbing and studio effects the duo does, with their producers Trent Freeman and Eric Wright. Our grade for audio quality is an A-minus. The sound is largely clean, with the studio effects used judiciously. But, here is my weekly complaint about excessive volume compression, jacking up the loudness artificially by squashing out most of the dynamics of the performance. When will people learn that louder is not better? A fiddle and a cello together sounds like something that happens when half a string quartet doesn’t show up. But Oliver the Crow weaves their two instruments into an enjoyable and distinctive album that has staying power beyond the novelty of the instrumentation.